The new Car Air Purifier is the perfect companion for any car interior, instantly improving the air quality inside your cabin. In addition to removing dust, pollen and pet particulates from the air, it also is effective in neutralizing tobacco smoke, pet and food odors from your car interior. This ionic air purifier is simple to use and filter-free; just plug it in and it starts working immediately. The Nova Car Air Purifier produces 5.6 million negative ions per cm³. These negative ions attach themselves to airborne particulates and causes them to drop from the air leaving your interior much cleaner with less dust. It's a great accessory for those who are prone to allergies or dust sensitivity. After just a week, you will start to notice that your interior cabin stays dust-free for longer periods of time. By producing safe levels of ozone, the Nova Car Air Purifier destroys odors, leaving your car interior smelling fresh and clean. The longer you use it, the fresher your cabin smells. You'll know that it's working if you get close and smell ozone emanating from the unit, which is a scent similar to the air after a thunderstorm. Additionally, ozone is an effective antimicrobial agent giving you the confidence of a more sterile cabin. POWERFUL ODOR ELIMINATOR - SMOKE, MOLD, FOOD, PETS, SPORTS GEAR & MORE: Life stinking up your vehicle? Family and pet SAFE ozone technology quickly destroys persistent car interior odors & kills bacteria and viruses by generating SAFE levels of ozone - leaving ZERO residual smell. CLEANS & PURIFIES ALLERGENS - FOR POLLEN, ASTHMA & OTHER TRIGGERS: The reviews show it works, but how? Negative ions attach themselves to dust, pollen, smoke, dander and other common airborne particles so they drop from the air - far More EFFECTIVELY than standard car air fresheners. Great for smokers and pet owners. Your nose (and passengers) will thank you! RAPIDLY CHARGE 2 DEVICES - DUAL USB CHARGER: Don't wait hours for a full charge. Powerful, rapid charging 2.1 Amp USB charger ports with 2 CHANNEL TECHNOLOGY infuses maximum juice to your iPhone or Android phones & tablet, so they charge lightning fast. An ideal accessory for ride share vehicle drivers. COMPLETELY REDESIGNED - PURIFIES FASTER THAN EVER: Upgraded 2.0 Nova purifier infuses a full 5.6 million negative ions per cm³ - for a 15% faster clean than ever before. It also emits a calming blue glow, enhancing your mood and cabin interior. 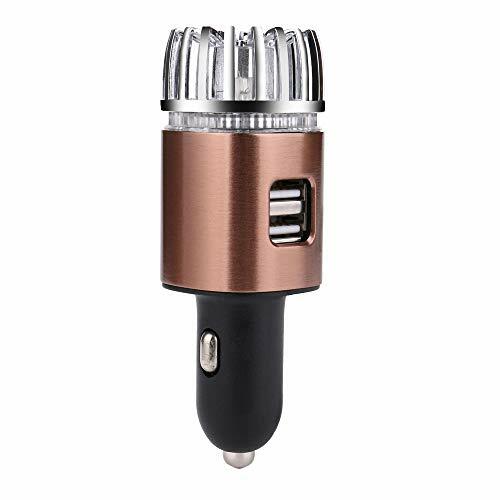 Product Contain: 1*Negative ion car charger 1*Instruction manual,If you have any quetions, don't hesitate to contact us! If you have any questions about this product by JP-DPP9, contact us by completing and submitting the form below. If you are looking for a specif part number, please include it with your message.